Southern Comfort‘s “Whatever’s Comfortable” campaign has moved along with “Shampoo”, a new television commercial set in a hair dressing salon. 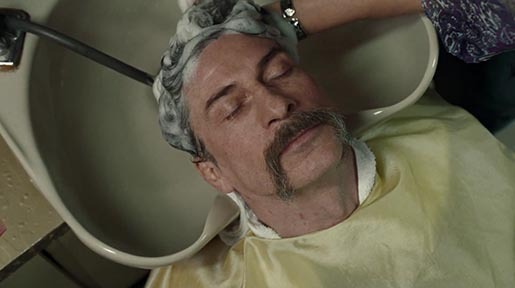 The Southern Comfort man may not be your typical salon goer, but he doesn’t care, because he’s comfortable with it. Souther Comfort’s “Whatever’s Comfortable” campaign champions the attitude it takes to be yourself, and celebrates those people who captivate us because of it. The Shampoo ad was developed at Wieden + Kennedy, New York, by executive creative directors Scott Vitrone and Ian Reichenthal, creative director Jimm Lasser, creatives Nick Kaplan and Jeff Dryer, producers Orlee Tatarka, Charlotte Arnold and Orlaith Finucane, executive producer Holly Vega, head of content production Lora Schulson. Filming was shot by director Tim Godsall via Biscuit Filmworks Los Angeles with director of photography Darko Suvak, line producer Rick Jarjoura. Editor was Gavin Cutler at MacKenzie Cutler with assistant editor Ryan Steele, post executive producer Sasha Hirschfeld. Visual effects were produced at The Mill by head of production Sean Costelloe, creative director/lead Flame artist Jade Kim, nuke compositors John Mangia and Sabrina Tenore, CG artists Emily Meger, Laurent Giaume and Ari Hwang, VFX supervisors Peter Smith and Peter McAuley. Sound was mixed at Steve Rosen at Sonic Union. Music is “The Beat” by Lou Johnon. Music was supervised by Andrew Charles Kahn at Good Ear.